The Pieta is a well-known sculpture created by Renaissance artist Michelangelo. It is housed in St. Peter's Basilica in Vatican City and is the first of a number of works of the same theme done by Michelangelo over a series of years. The sculpture was originally made for the French cardinal Jean de Billheres' funeral monument, but was moved to its current location in the 18th century. It is the only piece Michelangelo ever signed. 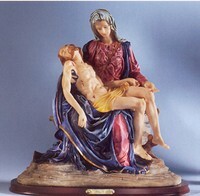 The Pieta sculpture depicts the body of Jesus on the lap of his mother after his crucifixion. The Pieta statue is modeled after a theme that had been popular in France, but was not yet known in Italy. The sculpture is unique in that it balances Michelangelo's Renaissance style with classic design and naturalism. The piece is one of the most detailed sculptures ever done by the artist. 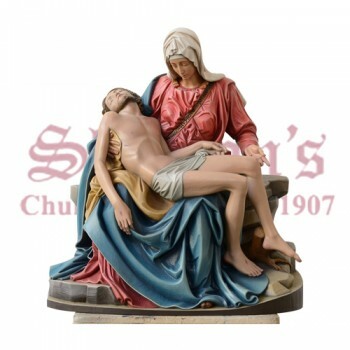 Sheehan's religious goods is pleased to offer a selection of replica Pieta statues to choose from. 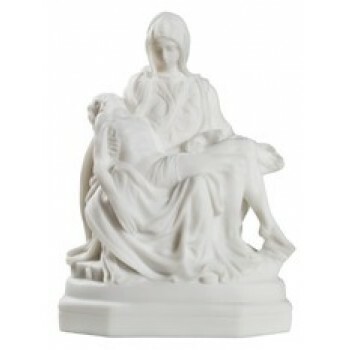 Our Pieta sculptures range in size and finish, but all maintain the distinctive appearance of the original. Whether you're looking religious garden statues or something for the lobby of a building, the Pieta is a fantastic choice you're sure to love.